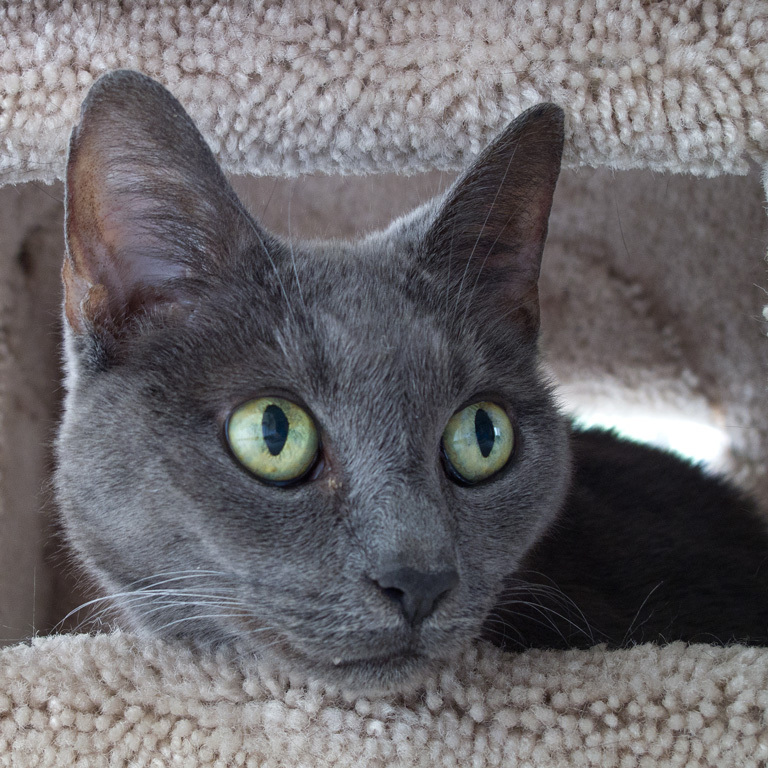 Tasha (aka Hyper Cat) peering from the window of her climbing tree "house." Our cat Tasha was diagnosed with hyperthyroidism a couple of months ago. She’d probably had it for quite some time before diagnosis but we’ll likely never know that for sure. At any rate we tried the usual medical treatment –methimazole– with some success but giving two tablets a day to a cat isn’t fun for anyone. So we tried a trans-dermal gel compound which, while effective, may or may not have led to a sudden case of vestibular “dizzy cat” syndrome. So we switched back to tablets. Soon after switching back to tablets poor Tasha’s irritable stomach began acting up and she couldn’t keep food down. What to do? Dr. B. recommended treatment with Iodine 131 and referred us to The Cat Company — a place where staff have the training and confinement facilities to deal with radioactive isotope treatment. Tasha was admitted for treatment today, in good health but for her hyperthyroidism starting to show up again: racing heart, increased appetite, weight loss, hyperactivity. Dr. Mann, there, said she’s a pretty typical case and, as he observed her behavior in the examination room, thought she had a “very good attitude.” She’ll have received her single small dose of radioiodine by now and should be resting in interesting, soothing surroundings where she’ll spend the next few days. We may well miss Tasha more than she misses us. She is now, also, radioactive! I suppose we shouldn’t expect her to emerge from treatment with super-powers, like a spider-bitten Peter Parker, or a radiation-exposed lizard from one of those ’50s monster movies. Given feline habits, armament, and inclinations, it’s probably best Tasha not have super-powers. So we eagerly await the return of our mildly-radioactive kitty and look forward to her being cured of hyperthyroidism — no pills, no gels needed. Super-powers aside, perhaps we’ll nickname her Hyper Cat!